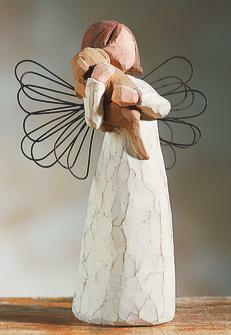 Willow Tree by Demdaco is an intimate, personal line of gift angels designed by artist Susan Lordi. Susan's inspiration comes from a love of family, closeness to friends, and an appreciation of nature. Her designs reflect that which helps us treasure our relationship to people and the world around us. Demdaco Willow Tree products are a thoughtful gift for every occasion. Backdrop is not included. You can earn 17 Grandmas Under the mattress CASH points on this product!